Shaggy mane mushrooms are long and slender when they first come up. The caps have scales that give them a shaggy look. 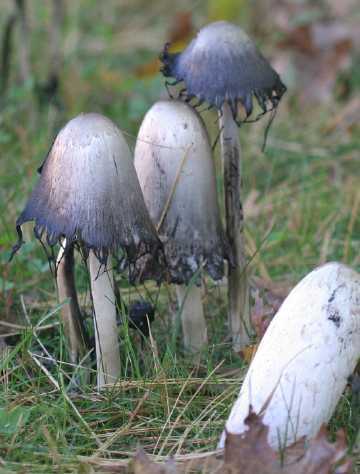 Shaggy manes dissolve into drippy black goo over time, as the mushroom caps slowly digest themselves. 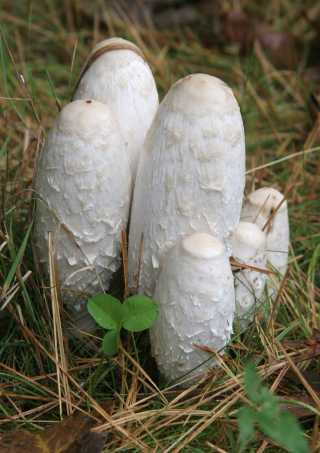 Shaggy manes and other self-digesting mushrooms are known as inky caps. Perhaps shaggy mane mushrooms can inspire some new Halloween costumes this year. A trick-or-treater wearing a sheet doesn't have to be a ghost. Paint an uneven black border on the bottom of the sheet to look like the drippy black goo, or sew on a black fringe, and you've got a shaggy mane.